Nowadays, the ‘Triumph’ name is invariably associated with Siegfried Bettmann’s company, founded in 1889, which went on to become the world’s leading motorcycle manufacturer after supplying 30,000 machines to the War Office during World War One. But ‘Triumph’ was a popular model name for a bicycle in the early days. The most successful ‘Triumph’ was the Warman & Laxon range of Triumphs, produced from 1879. For a brief period, in 1880, Warman also registered the name ‘Triumph Bicycle Co.’ The Triumph tricycle was a state-of-the-art design of its day and one of the best-selling tricycles. The model featured here, with its rear wheel fitted behind to provide easy mounting from the front, was particularly popular for ladies. All the company’s tricycles were fitted with Warman’s patent non-stretching chains. John Icely Warman, born in 1848, was one of the first generation of cycle manufacturers, having started with the Coventry Machinists Co. Ltd in 1868, working alongside Starley, Singer, Hillman, etc. He joined Smith Starley & Co before starting his own company in 1876, in partnership with William Laxon and Francis Aslatt. Warman’s Triumph name seems to have been discontinued after 1888, so it’s likely that Bettmann bought the rights to the name when he started his own company in 1889 as the ‘Triumph Cycle Co’. Warman & Hazlewood Ltd (1890). The latter was floated with capital of £70,000 in £10 shares of which £47,320 was subscribed and £20,000 allotted to the vendors in deferred shares. In its first two years a dividend of 10% was paid on both classes of shares. The Warman & Hazlewood trademark in 1891 was two inter-twined circles with initials in each. Warman patented an improved drive for the tricycle (1878/3310). The ‘Rival’ high-wheeler was produced from c.1887 and the ‘Albion’ tricycle in 1889. The ‘Safety’ and ‘Victoria’ were made before 1892. Warman, Laxon & Co. produced the ‘Triumph’ folding tricycle in 1879. Two set screws could be undone and the spindle holding the nearside wheel would slide through the frame tube. There was also the ‘One-track’ sociable, made in 1886, in which there were two small wheels outside of the main driving wheel and steerer which were in line. The two small wheels did not normally touch the ground when riding. The ‘Coventry Cross’ was later offered. 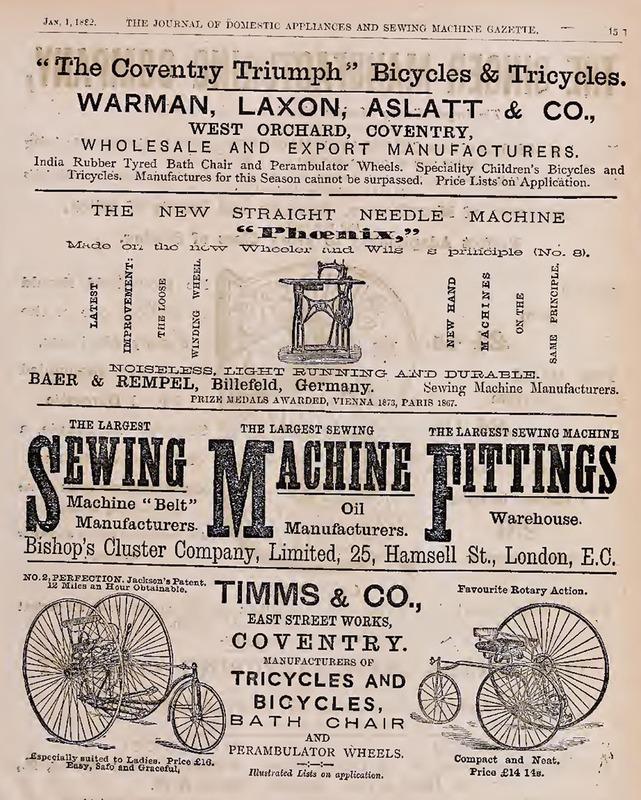 The company made losses from 1893 to 1896 when it was acquired on 1 May 1896 by the Coventry Cross Cycle Co. for £46,131. It was common practice for a cycle firm to be wound up and then be bought by the original owner: as ‘Coventry Cross’ was a model name from Warman’s previous company, this might have been the case. (In some Coventry Cross advertising, they claimed their company was founded in 1876, the date of Warman’s first company). Warman emigrated to the USA in 1893 or 1895, buying a farm in Michigan. He died at Berrien Springs in 1931. Coventry Cross became a subsidiary of Royal Enfield, probably in 1906, and they then manufactured Royal Enfield’s budget range of bicycles. Though Coventry Cross was not a successful company, Hazlewoods Ltd, founded from the remains of Coventry Cross, went on to make motorcycles as well as bicycles; the company apparently ceased trading in 1928. With regular changes of investors backing his firms, and the company names being updated accordingly, information on Warman’s businesses is confusing and conflicting. I found the following newspaper reports (below) which seem to contradict some of the dates published in the book ‘Coventry’s Bicycle Heritage’ and other sources, so I’ve combined the various pieces of information to provide an overall picture of Warman’s cycle manufacturing history. Accumulating a vintage collection usually requires hard work and persistence; a lot of ‘horse trading’ takes place, and a certain amount of luck is involved too. This fabulous machine was stored in a private collection for 40 years. When the collection was sold at auction in May 2016, my friend bought it via telephone bidding. He explained to me a few days later that though he had been bidding on it, he didn’t realise he’d actually bought it until he received the bill, and he didn’t want it. Was I interested in taking over the purchase? I’d just bought another machine from him and used up all my cash, so we ended up swapping one of my early bicycles for this tricycle, and I collected it from the auction site. The ambiguous auction catalogue photo and text suggested it was a Cheylesmore double driver with one drive train missing. So, after picking it up, I sent some photos to my friend Andrew, because he owned a Cheylesmore. His reply was a shock and a very pleasant surprise. It was not a Cheylesmore double driver, but a Warman Triumph single driver. Both Andrew and I are avid Triumph collectors, and Andrew used to be the Triumph marque specialist. So, as you might imagine given the circumstances previously mentioned, Andrew added some choice phraseology to his revelation. It’s one of only two known surviving Warman Triumph tricycles and, yes Andrew, I am a lucky ******. The photos above and below are how it looked when I first saw it. The sympathetic restoration work was carried out by Julian Parker.